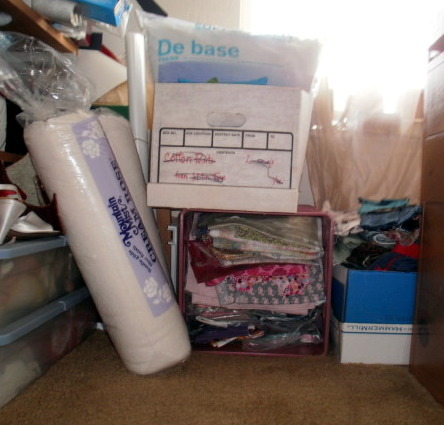 I have reached a point in consolidating my stuff that I’m accumulating empty bins, boxes and crates. The good news is organizing is getting easier. 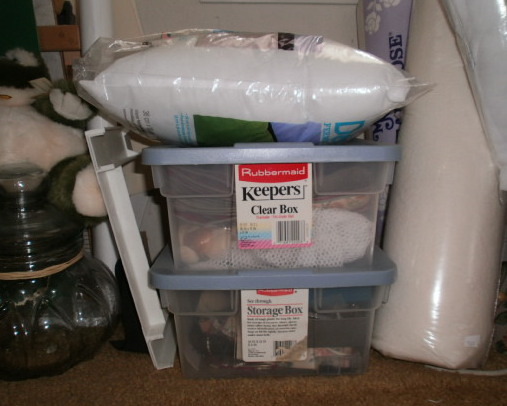 I’m seeing how I work in a different light, and how to store things so I will remember where I put them (even the things that don’t get used often). 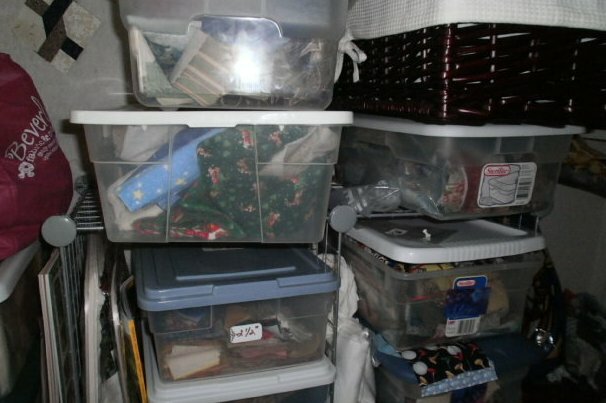 The bad news is I’ve collected a boatload of bins over the years. One advantage to having empty bins is cleaning the table for the holidays this year will be a snap. My husband made me a beautiful desk, which is filled with stuff, which is why I collect the mail on the kitchen table, and other items that need to find someplace else to live. As you can imagine, it takes longer for me to clear off my end of the table than it does to cook a holiday dinner. After Thanksgiving, I decided to get a head start on a New Year resolution to keep up with the mail. “Self,” I said, “You already keep up with the bills, so why can’t you keep up with the rest?” So far, I’ve put almost everything in this one little bin. A lovely consequence of my resolution to keep on top of things was deciding to get my Progressive project done now. 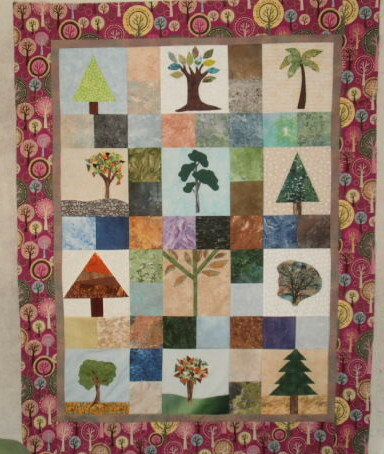 I already knew the quilt only needed a simple border on the top, bottom and right because the last person did the fabulous applique of monkeys and bananas in the jungle. Now if only I can keep this momentum going throughout the holidays. Well begun is not half done if you forget that you’ve made that first step – which I did with my bead collection. I thought I had squirreled all my beads in one bin. 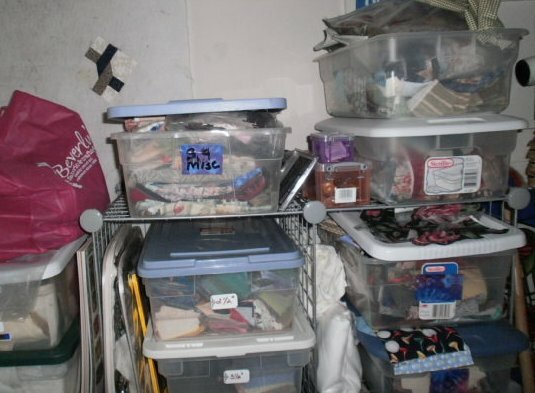 The bin wasn’t labeled, and there were bits and bobs of old projects among the tubes and boxes of beads. 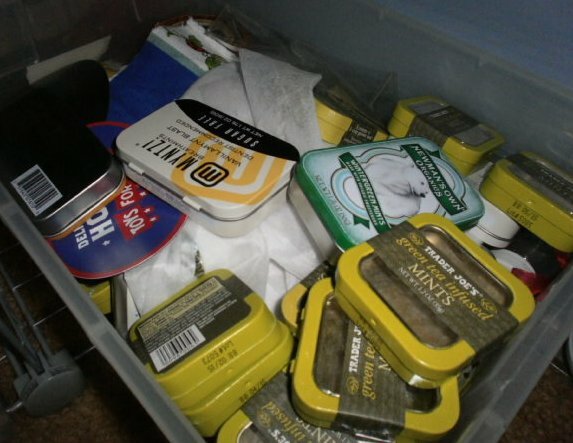 I took a lidded plastic box and prepared to sort things out. 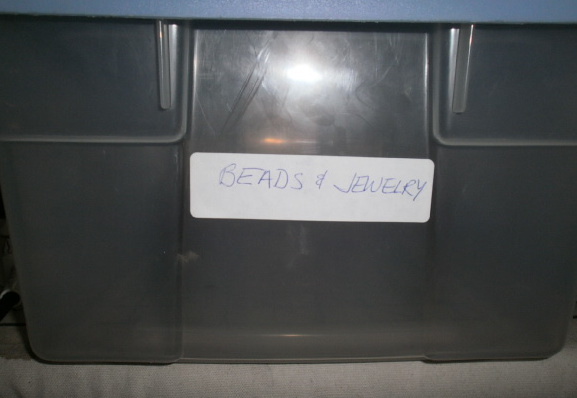 I thought I had plenty of room to store my beads as well as some old jewelry that I take apart for embellishments in this box. 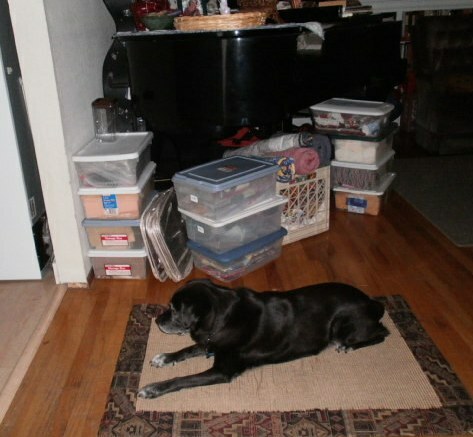 As I separated the beads from all the other clutter, however, I realized I had more beads than were in the bin. The impetus to sort the bin came from the Challenge project. My art critique group gave me permission to smother the piece with beads, especially black ones. I started with the one tube of black beads I found in an abandoned project bag. 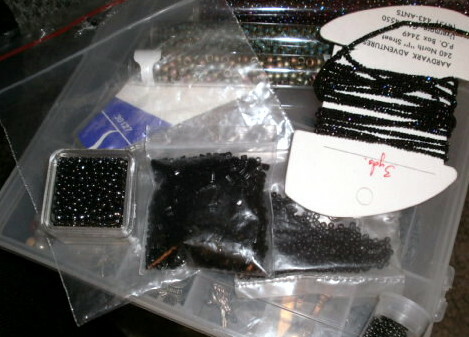 The thing is, I knew I had more black beads. When they didn’t appear in the first bin, I started looking through others. 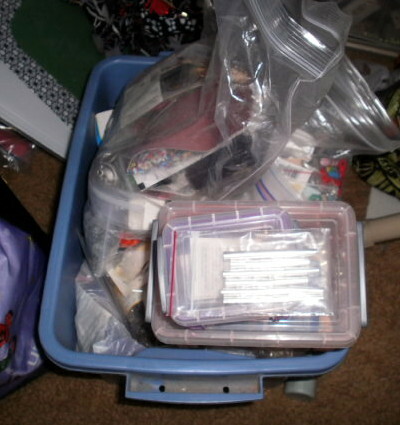 Imagine my surprise when I found three other bins holding bead collections. Imagine how red my face was when I realized that I had started sorting beads many times and forgot. The good news is I found my black beads. The better news is I re-labeled the box. 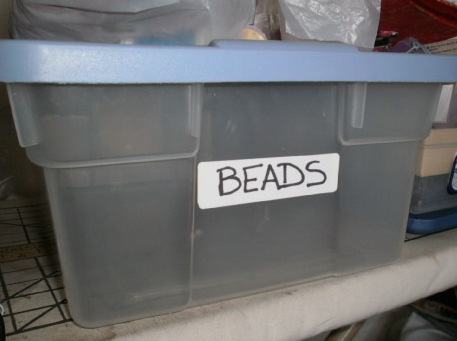 The best news is I cleared out all the other bins and put my entire bead collection in this box. At least, I hope it’s my entire collection. 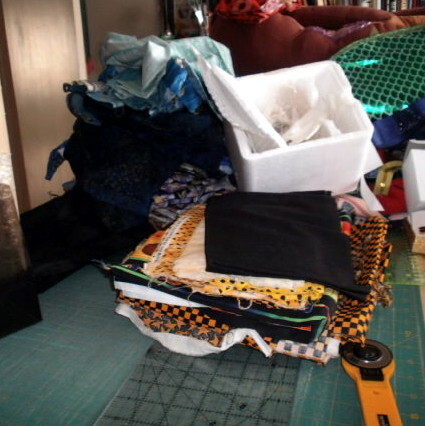 The studio is still a shambles, but I am making progress on the to-do piles. This week, I got to the Progressive Party tree project and found a treasure – a surprising border and backing at the bottom of the tree collection bin. 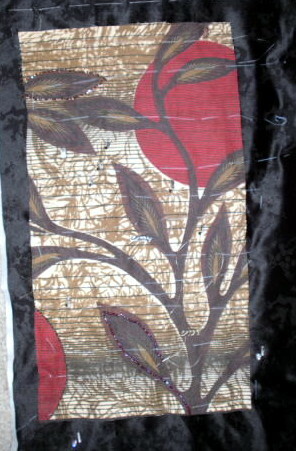 This quilt will sit on the upstairs day bed – when we get it. In the meantime, it will sit on the cot and be available for me to admire whenever I like. 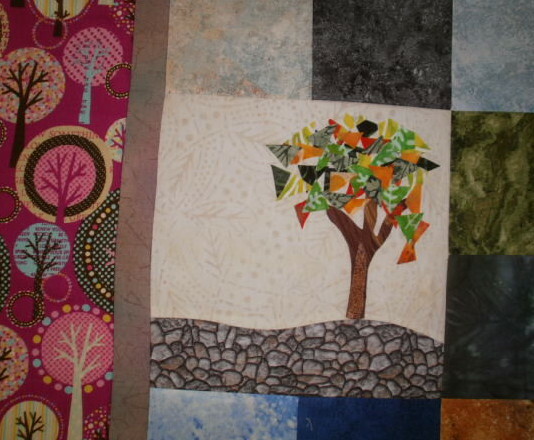 The tree project had only two requirements – an 8″ finished block with a tree on it. The color choices were totally up to the individual. To my mind, the blocks complemented each other as if they had been planned. I found a package of 5″ squares (I believe Stonehenge Stone Chips) for the interior. 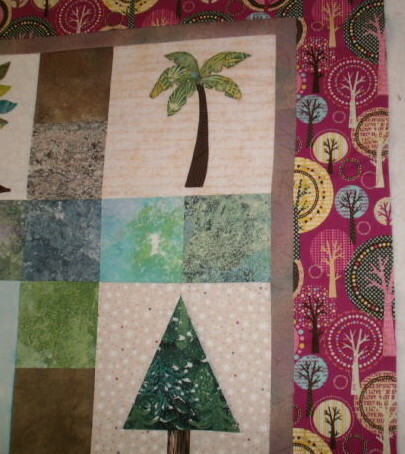 As I was pawing through my tree fabrics, I found the pink tree fabric which I probably bought for a back. 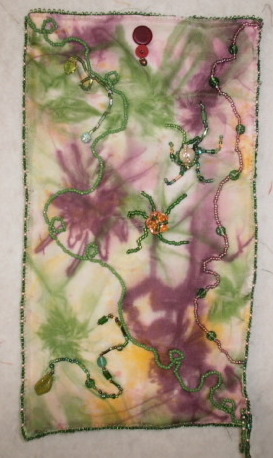 While I had thought of using a green for a border, this piece begged me to audition it. 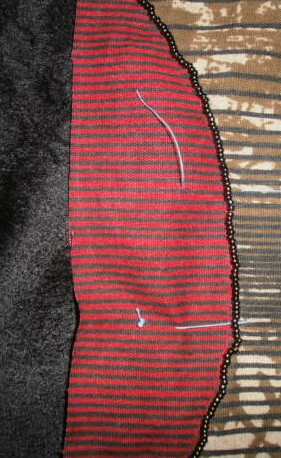 There was enough to fussy cut the border and and still have a good chunk for the back. I think it works, and since it’s for me that’s all that counts. You know the warning about making a new pillow for the couch and the curtains look dingy, so you clean the curtains and the walls look dated, so you paint the walls and the rug looks horrible . . . and eventually you’ve redecorated the whole house? That’s where I am. 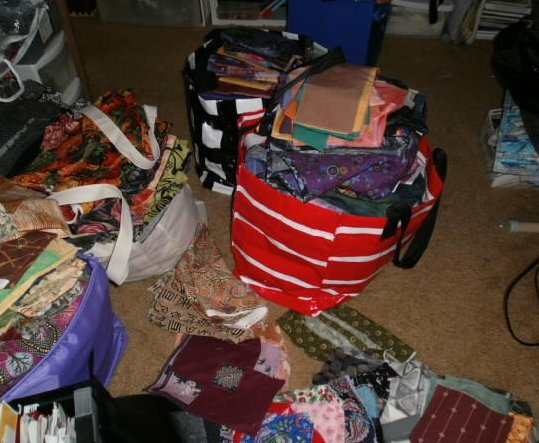 I started a sort-out of the sewing room, and now all the other piles that need organizing are calling my name. 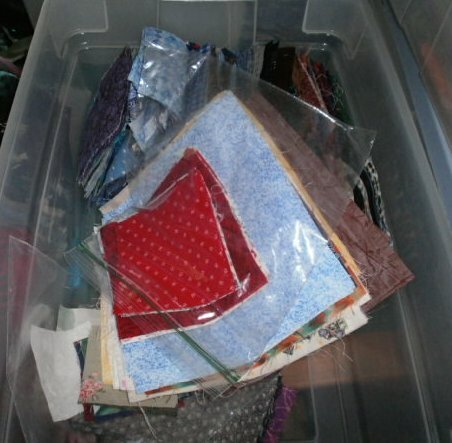 The last of the supplies for the prison quilting program went to their new home. 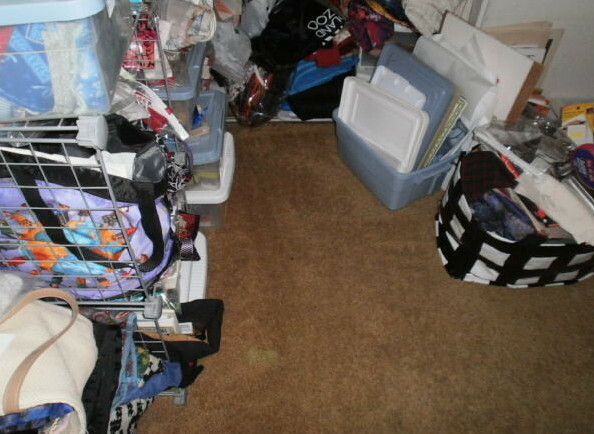 I had a plan for using that new-found space, but I made the mistake of looking in the bins. This is one of two bins that hold my mint tin collection. The Trader Joe’s mints (which are delicious) come in a cute square tin with a clear panel in the lid, perfect for holding beads. I’ve been collecting them for quite a while. Usually I open the bin and toss the tin inside without looking at how many are in there. Now I’m looking. Oy. Then I went into the kitchen and really looked at the overflow spice stash. 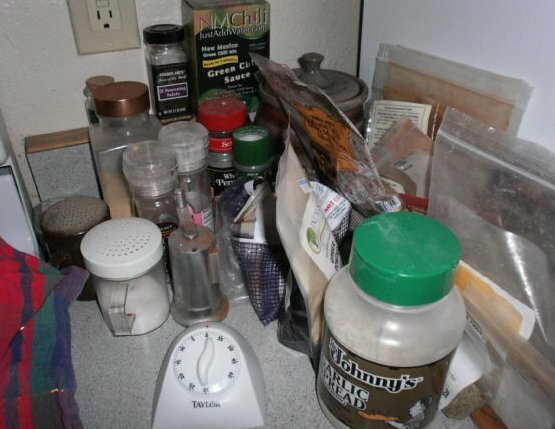 I love having herbs and spices on hand, but when the kids moved back home with their spice collections things spiraled out of control. No matter how much cooking and baking I do, the spice stash seems to grow, not contract. Woe to me. As a final exercise in self-punishment, I scanned my collection of notes for books and stories I want to write (or have started writing but put aside for one reason or another). 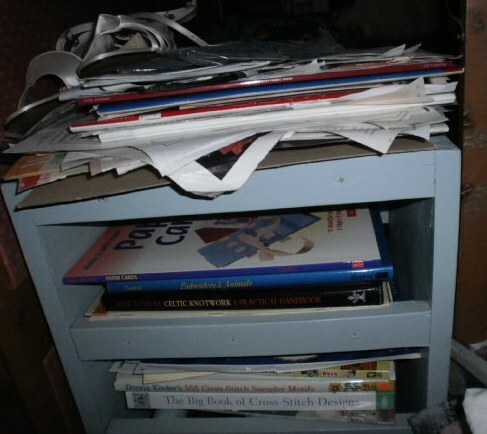 Attending to these piles will take a lot of time and energy. 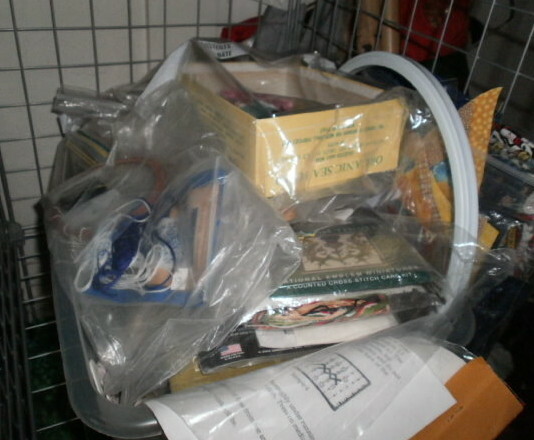 It isn’t enough to organize the stacks of stuff, I have to do something with them. 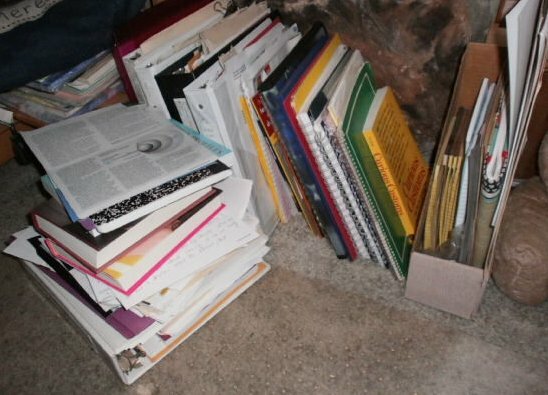 Organizing – for me, anyway – works really well when I rarely touch the pile again; attending, not so much. I organized this small shelf months ago and it is still tidy. Of course, the fact that I haven’t been able to reach it for months might have a lot to do with it being orderly. 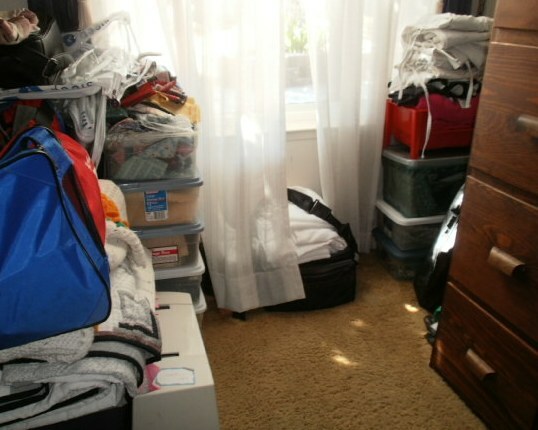 Perhaps, in the spirit of Thanksgiving, I should be grateful for the Great Sort-Out. If I turn this into an early New Year’s resolution, then I can check something off the 2014 to-do list right now. We take our victories where we can. We had a four-day party at our house last weekend. Between the Scottish Games, family and friends, there wasn’t a dull moment. The best part was I could completely enjoy the celebrations because I turned my studio into a guest room. 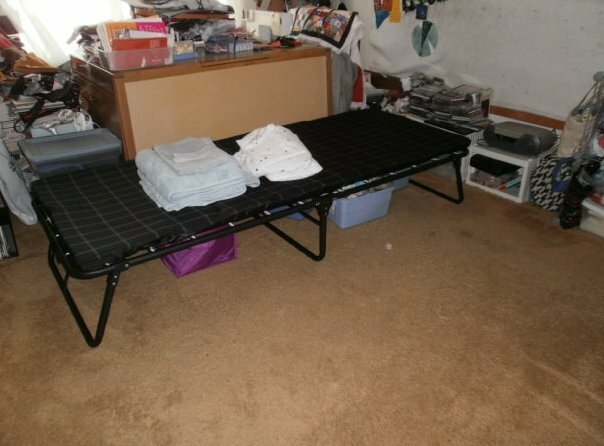 True, a cot in the sewing room doesn’t rival the Hilton, but considering all the stuff I had to move around, I was thrilled to recover as much space as I did. Thank heavens for little bins, and totes, and hampers. After a week of sorting, consolidating and tossing, I had some things squirrled away. 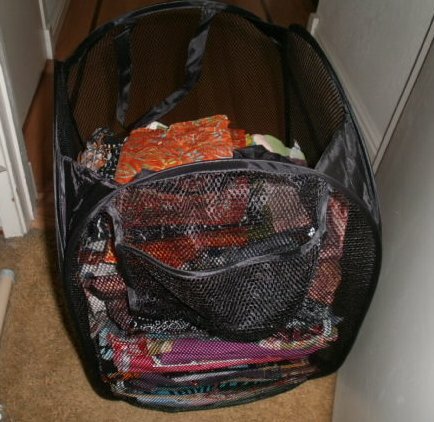 I also found a never-used collapsible clothes hamper that I bought for one of the kids heading off to college (I won’t comment on why the child didn’t bring it along). My husband gave me dispensation to bring the stuff out to the garage for the duration of the visit. I have to bring everything back, and the sooner the better, but at least I’ve had one sort out. 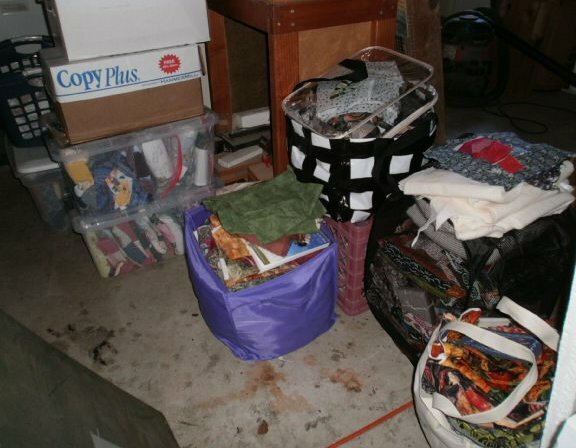 If I’m clever (and my husband is patient about reclaiming his garage space), I’ll bring in one bag, tote, or bin at a time and put the contents where it belongs, not where it fits. If I’m clever . . .